During these testing times we should not underestimate the contribution that entrepreneurs are making to the recovery of our economies. 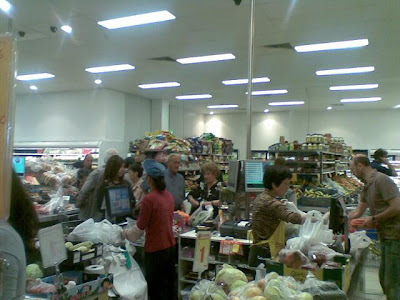 This was rammed home to me on Saturday when , after our morning coffee, we visited a new supermarket in Bentleigh. Run by a little Chinese lady this shop, CK Food Store in Centre Road (near the new Richies IGA store), is absolutely groaning with fresh fruit and vegetables, an attractive spread of fish and meats and food treats from all over the world. As I wandered around viewing the enterprise through the eyes of an accountant, I pondered the difficulties she must have encountered. Firstly the Australian dollar has dropped over the last few months and quite a bit of her stock would've been imported. Her margins would be under pressure and she would need to get her turnover higher to compensate.Tough times for retailers to increase turnover! Secondly she would have needed to finance the set-up and the stock. No easy task in today's environment. And then selection of staff! But the place was packed and it was not hard to see why. There was simply an amazing selection of the most interesting foods, drinks etc. Most of the fruit and vegetables were local, but there were foods from Asia ,Dutch sweets and other goodies. I was heartened because it took me away from my current thinking rut associated with the crisis. We need to encourage entrepreneurs. In reference to the comments regarding this store that have been left below I would like to make further comment. This blog post was written when the store was first opened. It is a salutary lesson that entrepreneurs should never take consumers for granted. Entrepreneurs might be full of good ideas but they need to execute them in an effective way in order to sustain their businesses. As well it is imperative that the fundamentals of business models are respected. For instance a business model involving food will need to pay heed to hygiene and proper storage of vulnerable foods. In addition a simple thing like the smell of a food-selling premise needs to be addressed because , frankly, many consumers will take their purchasing signals from these subtle presentation aspects. Consumers are fussy and will vote with their feet. It will be interesting to see how the owners respond to the adverse publicity. I love C K Food Store! staffs are very rude exspecially the one in the counter ( young chinesse girl)....the veges are not fresh at all...the meat is okay. Thhis is one of the best fruit and veg places I've been to. Cheap and great quality. The staff do Need training in customer service skills though, that's my only whinge !! I love C & K the selection of meat, fish and seafood and fruit and veg are amazing and very reasonably priced. The asian groceries are also wide in variety and reasonable. To get back what you give, in otherwords if you are nice to the staff they are nice back! What about the court fine in May 2011 for "filthy supermarket" after inspection from the council... shop here at your own risk!! I shop at C& K every couple of weeks but only to buy certain foods (not meat and seafood). I only come here as it is also closer than going to Springvale or Richmond. The Asian dried foods are cheaper than Coles and Woolworths and I like their refrigerated noodles which so far I haven't had any problems with. The check out staff though are generally very rude and do not provide the proper service the customer needs - that is, they are generally too busy bagging up fruit and vegies to offload to customers rather than serving customers who want to just pay for their goods and go. I'm glad they got fined for their bad food hygiene practices though.